Things could start to get a little prickly as the General Election campaign gets underway in Solihull. A NEW round of the Regional Growth Fund has opened with the deputy Prime Minister calling on businesses across the country to bid for a share of the £350million cash pot. MASSIVELY unpopular plans to transform Solihull’s political map looked to be in serious doubt this week. EXPANDING Birmingham Airport will be a major boost to the local economy Nick Clegg said on a visit to the site last week. SOME Lib Dem activists have accused their leader, Nick Clegg, of being too close to his Conservative counterpart David Cameron. SOME of the recently published Boundary Commission proposals on Parliamentary constituencies ‘border’ on nonsense! JAGUAR Land Rover (JLR) has confirmed that it is to invest £355 million in a new factory in Staffordshire, to produce a new generation of low emission petrol and diesel engines. SOLIHULL currently gets back just half the £100m in business rates it hands over to the Government. In February the Solihull News ran a story about the benefits of HS2. AHEAD of next month’s local elections, the Solihull News speaks to Lib Dem group leader Councillor Ian Hedley. In reply to Mr Caffery’s letter of April 1 about my column highlighting the 29 per cent drop in teenage pregnancies in Solihull in the last 10 years I would like to point out that this figure refers to conception rates and not birth rates. ELECTORAL reform isn’t the way to clean up politics, according to an opponent of the Alternate Vote (AV). 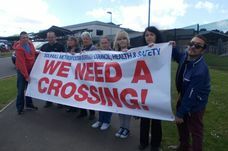 FEARS have been reignited about services at Solihull Hospital being moved outside the borough. LIB Dem leader Nick Clegg has said he’s not ignorant to the challenges facing his party. New Panto’s not Wishee Washee! SHIRLEY West Lib Dem councillor Simon Slater has defected to the Labour Party. THE Conservative-Liberal Democrat governing coalition is going through a “honeymoon period” at present but it could come under some pressure later, a Tory elder statesman has warned.